With other natural falvors. A zesty lemon blend with a hint of ginger. Caffeine free. For use in all Keurig K-Cup brewers. Family tea blenders since 1945. Lemon Ginger: We're proud of our recipe. This recipe takes lemon and ginger to a whole new level. Ours is a smooth, tasty and refreshing brew with the perfect partnership of lemon and ginger. A comforting blend to sip when you are feeling under the weather or simply looking for a soothing cup any time of day. Family Tea Blenders Since 1945: For three generations, the Bigelow family has specialized in creating a variety of deliciously different teas. Using only the finest ingredients and secret family recipes ensures that each cup of Bigelow Tea is backed over 70 years of family passion. - The Bigelow Family. 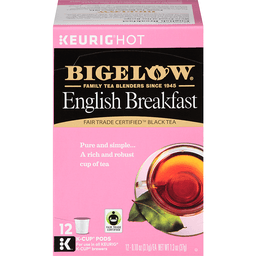 Try All Varities: Bigelow Green Tea; Bigelow Earl Grey; Bigelow English Breakfast; Bigelow Vanilla Chai. Caff-o-Meter (Represents average content; individual products may vary) Content Per Serving: Coffee: 100-120 mg; Black Tea: 30-60 mg; Green Tea: 25-50 mg; Decaf Tea: 1-8 mg; Herbal Tea: 0 mg. Bigelow Tea Facts: Family owned & operated since 1945. Our Promise: We're fully committed to your satisfaction and we love to hear from you! When you do call, please share the code number on this box with consumer services. Bigelowtea.com. For more information about Bigelow Tea, please contact us: 1-888-Bigelow (1-888-244-3569). For brewer inquiries: 1-866-901-Brew/1-866-901-2739; www.Keurig.com. Find us on Facebook.com/Keurig or Twitter.com/Keurig. For more fun facts follow us: Facebook; Twitter; FSS; Pinterest; Instagram. This package is made with a minimum of 35% post-consumer materials. Printed in the USA. 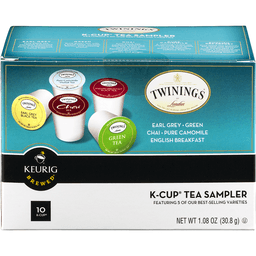 K-Cup® Keurig Brewed® Tea Sampler. Featuring 5 of our best-selling varieties. Twinings® of London, earl grey black tea. Twinings® of London, pure camomile herbal tea. Twinings® of London, chai tea. 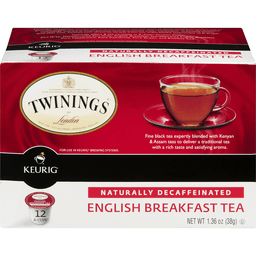 Twinings® of London, English breakfast black tea. Twinings® of London, green tea. Twinings® of London. Estd. 1706 - 216 The Strand, London, WC2, England. Earl grey, green, chai, pure camomile, English breakfast. 10 K-Cup®. Earl grey. Fine black tea perfectly balanced with the distinctive flavour of bergamot, a citrus fruit. Green. Pure green tea with a fresh taste, smooth flavour and enticing aroma. Chai. Fine black tea perfectly balanced with the sweet and savoury spice flavours of cinnamon, cardamom, cloves and ginger. Pure camomile. A relaxing herbal tea made using only 100% pure camomile blossoms. Naturally caffeine free. English breakfast. Fine black tea expertly blended with Kenyan & Assam teas to deliver a traditional tea with a rich taste and satisfying aroma. The Twinings story. In 1706 Thomas Twining began selling fine tea from an English store front in The Strand, London. Today, Twinings still sells some of the world's best teas from the original store and in more than 100 countries throughout the world. 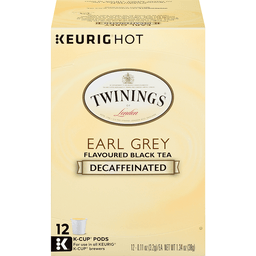 K-Cup® packs for use in Keurig® brewing systems. Keurig, the Cup and Star design, Keurig Brewed, and K-Cup are trademarks of Keurig, Incorporated. For questions or comments, please contact us at: Twinings North America, Inc. 777 Passaic Avenue, Clifton, NJ 07012 www.twiningsusa.com/1-800-803-6695. This package is recyclable. 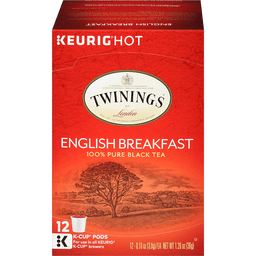 ©2012 Twinings North America, Inc.
Bigelow® Black Tea English Breakfast K - Cup® pods. Keurig® hot. Family tea blenders since 1945. Fair trade Certified™. Pure and simple... A rich and robust cup of tea. For use in all Keurig®. K - Cup® brewers. 12-0.10 oz (3.1g). Try over ice. Fill a big cup with ice cubes (do not use glass). Brew on smallest setting. Stir to chill. How do you brew Get creative and share. Bigelow Tea. Attn: Consumer Services Group Fairfield, CT 06825-5512. 1-888-BIGELOW. bigelowtea.com. Keurig® hot. Caff - o - meter. Content per serving. Coffee, 100-20mg. American breakfast, 60-90mg. Black tea, 30-60mg. Green tea, 25-50mg. Decaf tea, 1-8mg. Herbal tea, 0mg. † Represents average caffeine content: Individual products may vary. Our promise: We're fully committed to your satisfaction and we love to heat from you! When you do call, please share the code number on this box with the Consumer service crew. 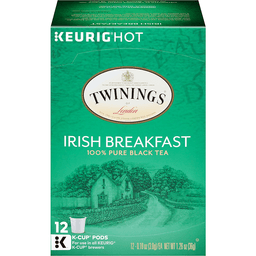 Try all varieties: Keurig® hot, Bigelow®, Classic Green Tea, Classic. 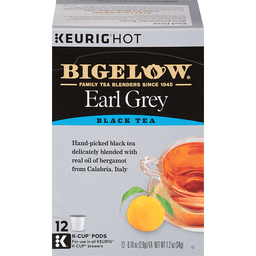 Keurig® hot, Bigelow® Classic, Earl Grey, Black Tea,. 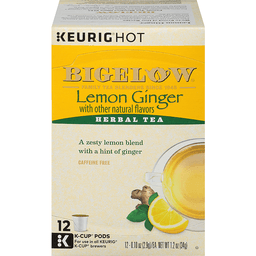 Keurig® hot, Bigelow® Classic, Lemon Ginger. 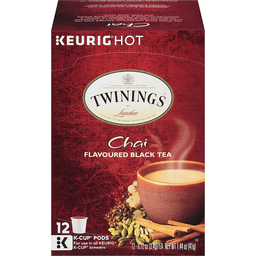 Keurig® hot, Bigelow® Vanilla Chai. Fair trade Certified™. English breakfast. We're proud of our recipe start your day with a rich, bold, robust cup of tea. We use only hand-picked tea leaves from higher up in the mountains where the best teas are grown. This full - bodied, yet smooth cup, gives just the boost you need in the morning or quite honestly any time of day! It's spectacular on its own or with a splash of milk. Bigelow®: Family tea blenders since 1945. For three generations, the family has specialized in creating a variety of deliciously different teas. Using only the finest ingredients and secret family recipes ensures that each cup of Bigelow tea is backed by over 70 years of family passion. The Bigelow family: Distributed by: Bigelow tea, Fairfield, CT 06825 - 5512 U.S.A. By choosing this fair trade Certified™ tea, you are directly contributing to the livelihood of tea growing communities. To learn more about fair trade, visit www.fairtradecertified.org. Printed in the U.S.A. Bigelow tea facts: Bigelow tea is a proud member of the ethical tea partnership. bigelowtea.com. Keurig, K - cup, and the k logo are trademarks of Keurig Green Mountain, Inc., used with permission. Ethical tea partnership. This package is made with a minimum of 35% post - consumer materials. For more information about Bigelow tea, please contact us: 1-888-Bigelow (1-800-244-3569) bigelowtew.com. For brewer inquiries: 1-866-901-brew/1-866-901-2739 www.keurig.com. 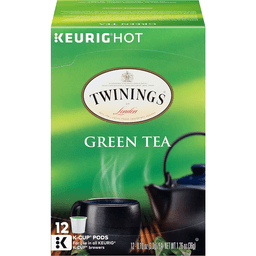 ©2015 Keurig Green Mountain, Inc. ©2015 Bigelow Tea.